Taking into consideration the standpoint of the software development life cycle, the right choice among top front-end frameworks will be the fundamental step of your future success. The market has a wide diversity due to the vast set to challenges that developers solve every day. Thus the number of front-end frameworks considerably increases. More and more different frameworks appear, and in this article, we would like to discuss top front-end frameworks in 2019. When you make your choice, keep in mind certain requirements that will help you greatly. Selecting your web framework, take into account both the users’ and development teams’ perspectives. Those features cover design, development, testing and maintenance stages. The proper front-end frameworks simplify and advance the development process at the same time. It should provide flexibility for further achievements whereas the customer receives excellent UX and UI. As for the development team, look for the framework that is comfortable to work with. Top front-end frameworks are always easy to maintain and test. Regular updates are must-have due to the rapidly changing demands of the market, new security threats, and versions of technologies. What is the market share of front-end frameworks in 2018-2019? What JS frameworks will be the most popular in the next years? Most of the web development frameworks offer the developer tools and support the unit testing and can ensure backward compatibility. Stability and community support are also the factors not to be forgotten therefore the availability of the experienced specialists on the market won’t be the issue. In order to achieve the desired results, you should find the best suitable web front-end framework that will meet the general and your own requirements. To find out more details, let’s start with the current trends and the overall market situation. WHAT IS THE MARKET SHARE OF WEB FRAMEWORKS IN 2018-2019? When the new JS framework appears, it is always designed with some specific goals in mind. Thus we can observe the competitive market that is full of varieties and choices. At the same time, we faced the problem that many frameworks sharply increased their popularity and in a short time came across the moderate decline of developers’ interest. The market of UI frameworks anticipates those trends as the new ones constantly develop and take the leading positions. 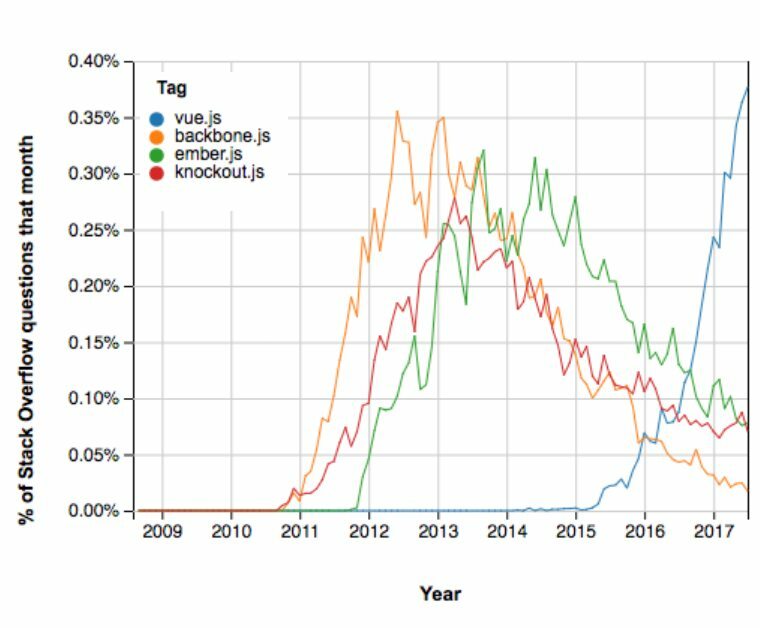 According to Stack Overflow, developers’ interest to React and Angular constantly growing since 2015, while the interest to jQuery AngularJS on the way down over time. At the same time, we can observe Vue.js as a new strong contender for the “older” JS frameworks. Same Stack Overfrom interest level data shows, that Vue.js is the only web development framework among the “younger” technologies, who started to show great potential in 2015 and can contend with “older” brothers such as React and Agular in 2019. Those three have features that affect productivity and are known for their high usability. UX developers turn their attention to such features as state management, form processing, validation, templating, HTTP communication, and routing. React, Angular and Vue.js. have already recommended themselves by meeting all these requirements. Something that should be mentioned is the simplicity of integration. Sometimes developers have to apply additional tools from different libraries. Avoiding that extra hustle with integrations and having all the needed tools in one place will be a great benefit for devs. Analyzing the survey data, we can get the following results: React is mostly applied by Node.js, Python and Rails developers, Angular is often used by Java, PHP, and C# developers, whereas Vue.js is popular among the PHP, SCC, and Node.js ones. Obviously, the technology adoption still depends on developers and companies. They try to choose the best technology based on its stability and community support as well. But we can easily admit that the overall professionals’ technology satisfaction level had considerably increased during the last year compared with the previous ones. Front-end development medium is rather dynamic and changeable, but for now React, Angular, and Vue.js have reached their leading positions. This survey by stateofjs.com shows that developers now are more satisfied with the front-end frameworks on the scale from 1 to 5. This trend started in 2015-2016 when React, Vue.js, and Angular started to be more widely used. In two years Facebook announced a new core algorithm – React Fiber. React has become the best front-end framework due to its distinctive features. Firstly, it works with the virtual DOM and applies abstract copies of the real DOM. Therefore it updates all the changes of the user but has no effect on other parts of the interface. Secondly, this web front-end framework makes the updates rather fast, as React connects DOM to the user interface functionality. It has the special ability of the reusing the code components of every level with no changes of them. Thirdly, a stable code is provided by the one-direction data flow. Applying any updates, only the chosen components will be changed. Besides Facebook, such companies as Instagram and Netflix have adopted React, which optimized their web performance and the development efforts to increased efficiency. Virtual DOM improves both the experience of the user and work of the developer – Virtual DOM helps to update any user’s changes without the other parts’ interference by applying isolated components. It greatly helps to smooth the experience of all participants in real time mode. Saving time while re-using React components – React deals with isolated components, that’s why you can reuse them anytime you need. System upgrades will not impact or change your system. An open-source library with a variety of tools – All updates are released to the community. React has had the open-source library and engineers can introduce the additional tools. Relatively long learning curve – It is unlikely to learn it in one day. It just requires a little bit more time to be aware of all the details than for example with Angular. Lack of documentation due to high pace development – The popularity of this web front-end framework is extremely higher than other ones. It has so many updates and innovations, that sometimes it is hard to find all detailed information. Vue.js is the web framework for building users interfaces. It is an independent tool that creates web interfaces and doesn’t require the additional extension. Vue.js was created by Evan You and initially released in February 2014. Probably you might not find the long list of big companies using Vue.js but it is definitely popular among developers and its popularity considerably increases. Clarity and simplicity – This front-end framework has the smallest API surface area. It is quite easy to start not only learning but using in a short time. Detailed and extensive documentation – You can find all the necessary documentation which is up-to-date and well-written. Also, there is always the community of developers who can share their knowledge with you. Simple integration and code reusability – Due to its logical structure, the user interface developers have the ability to create flexible components and reuse them later, even in the other projects. Browser devtools extensions – As mentioned above, Vue.js doesn’t demand any extra libraries, but it owns browser devtools extensions. Thus you can change separate components manually when it is needed. Smaller developers’ community – It is a relatively new and constantly improving framework. Vue.js is mostly supported by the individual developers but their user community fastly increases. Angular or Angular v2 or Angular 2+ is a complete rewrite of AngularJS by the same team in Google who developed the original front-end framework in 2010. It was released in September of 2016 as a completely new framework with new logic and features to address the challenges of web development as we know it today. Even the naming called a hot discussion in the development community, and it is needless to say that the complete absence of backward compatibility with AngularJS caused a huge controversy. Those who trusted Google and Angular community weren’t able to just upgrade their application to the new framework version to get all the new trendy dev tools and features. The app should be rewritten from scratch with Angular. Despite Angularjs users were left high and dry, this flop was addressed and all the versions of Angular ever since have the backward compatibility, which is very important for having it in our list of top front-end frameworks in 2019. Angular is an all-encompassing solution and is truly a framework instead of a just suite of libraries. Developers can focus more on accomplishing their tasks rather than looking for libraries and solutions for their tasks. This is definitely what makes Angular one of the top front-end frameworks now. Angular is created on in TypeScript which brings all of the advantages it provides: arrow functions, async/await, class syntax, etc. Introduction of well known OOP practices makes the transition much easier for shifters from languages like C# and Java. Created for the work in big teams, Angular leverages modules so each part of the team can work on their part of the code without being afraid to break anything in somebody else’s’ code. This also reduces the load for the work overlapping and QA. Component-based architecture of Angular allows creating the UI with single parts (components) and reuse these components in the app. The elements also simplify user testing and maintenance. High Performance – the Angular Universal Support helps render the apps on a server, and Google has already created the set of tools for this particular purpose. High performance is also predetermined by the Google Long – Term Support (LTS) maintaining the Angular ecosystem and developing it. Angular Material streamlines Material Design interface engineering – Angular team is constantly refreshing its framework with material design components. Large Ecosystem – well-known Angular Resources incorporates the UI environments, IDEs, analytics tools, facilities for ASP.NET, etc. Transferring legacy systems from AngularJS to Angular – the difference between AngularJS and Angular is huge, thus it takes a lot of time and efforts to migrate the legacy systems. Angular Complexity – despite the web-based structure, it is quite difficult to manage the components: e.g the devs need to have several files for one Angular component as well as maintain the elements’ lifecycle interfaces. Learning difficulty – the junior developers have to cover the bundle of things while learning Angular such as: components, modules, dependency injection, and many other things. The CLI documentation is poorly described and it does take a while for the developer to find out more about the CLI’s documentation on GitHub or other forums. WHAT FRAMEWORKS WILL BE THE MOST POPULAR IN THE NEXT COUPLE OF YEARS? If we take a look at npm downloads, we will notice the download changes of AngularJS and Vue.js, while React stays on top. IS THAT POSSIBLE TO CHOOSE THE BEST FRONT-END FRAMEWORK? Another thing to mention that React supports any browser. This framework is used to write native-rendered iOS and Android apps, while Vue.js is officially collaborating with Weex. Concerning performance tests and rendering speed, you can check the following table. If you require expert consultation about your project or looking for the exceptional web development services – feel free to reach out to our team. Existek has extensive web development experience and will be glad to provide you with the consultation. We build SaaS, web applications and robust enterprise web portals since 2012. You can fill in the form at our contact page, send us an email, or start the discussion in the chat widget on the right.